Although spike timing information is often used to encode features of a stimulus (Panzeri et al., 2001; Thorpe et al., 2001; Gollisch and Meister, 2008; Zohar et al., 2011; Gütig et al., 2013; Zohar and Shamir, 2016), it is not clear how this information is decoded by downstream areas (Buzsáki, 2010; Panzeri et al., 2014; Zohar and Shamir, 2016). In olfaction, a latency code is thought to be used in olfactory bulb (OB) to represent odor identity (Bathellier et al., 2008; Cury and Uchida, 2010; Shusterman et al., 2011; Gschwend et al., 2012). This information is transformed into a spatially distributed ensemble in primary olfactory (piriform) cortex (PCx) (Uchida et al., 2014). PCx is a three-layered cortex with well-characterized circuitry (Bekkers and Suzuki, 2013), providing an advantageous system to mechanistically dissect this transformation. Here, we develop a spiking network bulb-cortex model to examine how temporally structured odor information in OB is transformed in PCx. In mammals, odor perception begins when inhaled volatile molecules bind to odorant receptors on olfactory sensory neurons (OSNs) in the nasal epithelium. Each OSN expresses just one of ~1000 different odorant receptor genes (Buck and Axel, 1991). Odorant receptors are broadly tuned so that OSN firing rates reflect their receptor’s affinity for a given odorant and the odorant concentration (Malnic et al., 1999; Jiang et al., 2015). All OSNs expressing a given receptor converge on a unique pair of OB glomeruli (Mombaerts et al., 1996), where they make excitatory synaptic connections onto dendrites of mitral/tufted cells (MTCs), the sole output neurons of the OB. Because each MTC only receives excitatory input from one glomerulus, each MTC essentially encodes the activation of a single class of odorant receptor. MTCs exhibit subthreshold, respiration-coupled membrane potential oscillations (Cang and Isaacson, 2003; Margrie and Schaefer, 2003) that may help transform rate-coded OSN input into a temporal latency code in the OB (Hopfield, 1995; Schaefer et al., 2006; Schaefer and Margrie, 2012). Individual MTC responses exhibit odor-specific latencies that tile the ~300–500 ms respiration (sniff) cycle (Bathellier et al., 2008; Cury and Uchida, 2010; Shusterman et al., 2011; Gschwend et al., 2012), and decoding analyses indicate that spike time information is required to accurately represent odor identity in the OB (Cury and Uchida, 2010; Junek et al., 2010). Thus, the OB uses a temporal code to represent odor identity. Olfactory information is conveyed to PCx via MTC projections that are diffuse and overlapping (Ghosh et al., 2011; Miyamichi et al., 2011; Sosulski et al., 2011), ensuring that individual PCx principal neurons receive inputs from different combinations of co-activated glomeruli (Franks and Isaacson, 2006; Suzuki and Bekkers, 2006; Apicella et al., 2010; Davison and Ehlers, 2011). 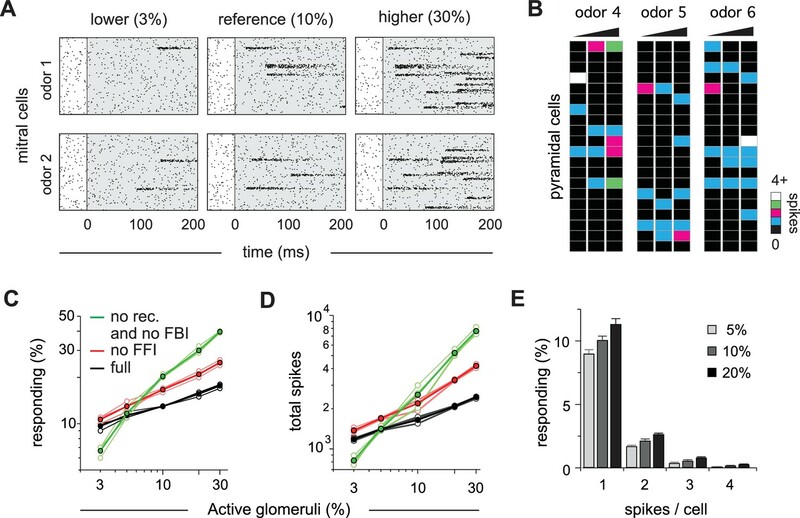 Consequently, odors activate distinct ensembles of neurons distributed across PCx (Illig and Haberly, 2003; Rennaker et al., 2007; Stettler and Axel, 2009; Roland et al., 2017). Recent studies indicate that odor identity in PCx is encoded simply by the specific ensembles of cells activated during the sniff, with no additional information provided by spike timing (Miura et al., 2012; Bolding and Franks, 2017). Thus, a temporal odor code in OB is transformed into an ensemble code in PCx. However, these ensembles are sensitive to the sequence in which glomeruli are activated (Haddad et al., 2013), indicating that PCx could parse temporally structured OB input. Whether, or how it does so is not known. Although MTCs respond throughout the respiration cycle, PCx recordings in awake animals indicate that most odor-activated cells respond transiently, shortly after inhalation (Miura et al., 2012; Bolding and Franks, 2017). Taken together, these data suggest that cortical odor responses are preferentially defined by the earliest-active glomeruli and that glomeruli activated later in the sniff are relatively ineffective at driving responses. To examine this directly, we obtained simultaneous recordings of odor-evoked spiking in populations of presumed MTCs and PCx principal cells in awake, head-fixed mice (Figure 1). Consistent with previous studies, a given odor activated a large subset of MTCs, with individual cells responding with onset latencies distributed across the respiration cycle (Figure 1C). By contrast, activity was much sparser in PCx, with most responsive cells spiking within 50 ms of inhalation (Figure 1D). At the population level, odors evoked a sustained increase in MTC spiking throughout the sniff (Figure 1E), while spiking activity in PCx peaks briefly after inhalation followed by a period of sustained suppression (Figure 1F). 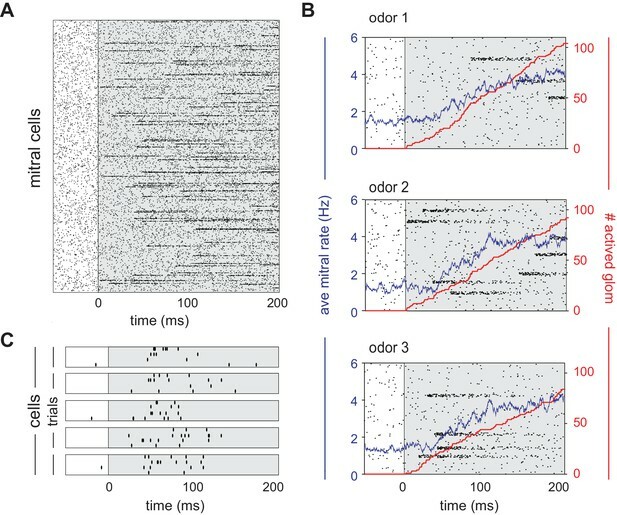 Together with the data discussed above, these results indicate that a spatio-temporal code for odor identity in OB is transformed into an ensemble code in PCx in which the cortical ensemble is largely defined by the earliest-active OB inputs and information conveyed by later-responding OB inputs is discounted. How is this transformation implemented? Because total OB output is sustained and can even grow over time, suppression of later responses must originate from inhibition within PCx itself. Multiple circuit motifs within PCx are poised to dramatically reshape odor representations. First, MTCs make excitatory connections onto layer one inhibitory interneurons that provide feedforward inhibition (FFI) to pyramidal cells (Luna and Schoppa, 2008; Stokes and Isaacson, 2010; Suzuki and Bekkers, 2012). Pyramidal cells also form a widespread recurrent collateral excitatory plexus that, in turn, recruits strong feedback inhibition (FBI) from a distinct class of layer 2/3 interneurons (Stokes and Isaacson, 2010; Franks et al., 2011; Suzuki and Bekkers, 2012; Large et al., 2016), and this intracortical recurrent circuitry is thought to contribute substantially to odor-evoked cortical responses (Davison and Ehlers, 2011; Poo and Isaacson, 2011; Haddad et al., 2013). The specific roles that each of these circuit elements play in shaping cortical odor ensembles is not known. 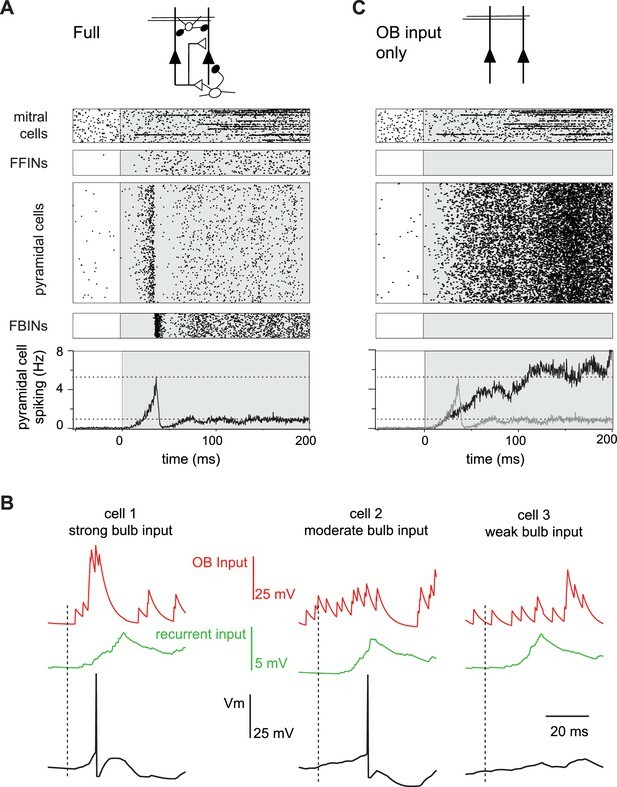 To understand how OB input is integrated and transformed in PCx, we simulated patterns of odor-evoked MTC activity over a single respiration cycle and used this as input to a PCx network consisting of leaky integrate-and-fire neurons. We first describe the implementation of the full model and demonstrate that it grossly recapitulates experimental findings. We then examine the specific roles that different circuit components play in generating these responses by exploring how the model behaviors change as the model parameters are varied. We find that PCx odor responses are largely defined by the earliest-active OB inputs, that the impact of these inputs is amplified by recurrent excitation, while the impact of OB inputs that respond later is suppressed by feedback inhibition. We further find that this configuration supports odor recognition across odorant concentrations, while preserving a representation of odor concentration in the synchrony of the population response. We simulated OB and PCx spiking activity over the course of a single respiration cycle consisting of a 100 ms exhalation followed by a 200 ms inhalation. Our model OB consisted of 900 glomeruli that are each innervated by a unique family of 25 mitral cells. Odor identities are defined by sets of glomerular onset latencies because different odors activate specific subsets of glomeruli with odor-specific latencies after the onset of inhalation (Figure 2A). Once activated, the firing rates of all model mitral cells associated with that glomerulus step from baseline (1-2 Hz, Kollo et al., 2014) to 100 Hz and then decay with a time constant of 50 ms (Figure 2B). The spiking of each MTC is governed by a Poisson process (Figure 2C). At our reference odor concentration, 10% of the glomeruli are typically activated during the 200 ms sniff. We modeled a patch of PCx, with connection probabilities and topographies that approximate those characterized in the rodent (Bekkers and Suzuki, 2013). The PCx model contains 10,000 excitatory pyramidal cells, each of which receives 50 excitatory inputs from a random subset of the mitral cells and 1000 recurrent excitatory inputs from a random subset of other pyramidal cells (Figure 3A). Our model also includes 1225 feedforward inhibitory neurons (FFINs) that receive input from mitral cells and provide synaptic inhibition onto the pyramidal cells and other feedforward interneurons, and a separate population of 1225 feedback inhibitory neurons (FBINs) that each receive inputs from a random subset of pyramidal cells and provide inhibitory input locally onto pyramidal cells and other feedback interneurons. We model all three classes of PCx neurons as leaky integrate-and-fire neurons with current-based synaptic inputs. Model parameter values were constrained wherever possible by the literature and are described in detail in the Materials and methods. Most of our analyses focus on pyramidal cell activity because these cells receive bulb input and provide cortical output and thus carry the cortical odor code. Low levels of spontaneous PCx spiking in the model are driven by baseline activity in mitral cells, and 2.8 ± 0.4% (mean ± st. dev) of pyramidal cells spike during the 200 ms inhalation in the absence of odor, consistent with spontaneous firing observed in anesthetized rats (Poo and Isaacson, 2009) and near, but slightly lower than, spontaneous rates in awake animals (Zhan and Luo, 2010; Miura et al., 2012; Bolding and Franks, 2017; Iurilli and Datta, 2017). We defined any cells that fire at least one action potential during the 200 ms inhalation as ‘activated’. Given the low spontaneous firing rates, there was no odor-evoked suppression of firing in the model. 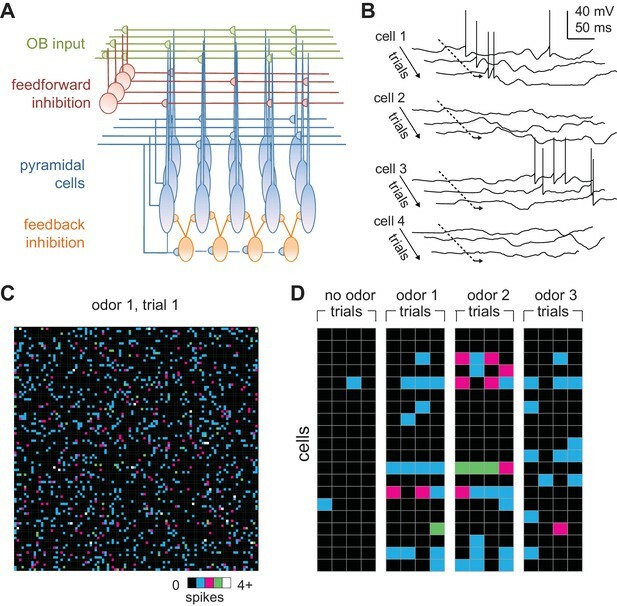 Because each piriform cell receives input from a random subset of mitral cells, different odors selectively and specifically activate distinct subsets of pyramidal cells (Figure 3B) so that each cell is responsive to multiple odors and each odor activates distinct ensembles of neurons distributed across PCx (Figure 3C). At our reference concentration, for which 10% of glomeruli are activated, 14.1 ± 0.59% (mean ± st. dev., n = 6 odors) of piriform pyramidal cells fire at least one action potential during a sniff, which is consistent with experimental data (Poo and Isaacson, 2009; Stettler and Axel, 2009; Miura et al., 2012; Bolding and Franks, 2017; Iurilli and Datta, 2017; Roland et al., 2017). PCx cells can exhibit considerable trial-to-trial variability in response to repeated presentations of the same odor (Otazu et al., 2015; Bolding and Franks, 2017; Iurilli and Datta, 2017; Roland et al., 2017). To examine trial-to-trial variability in the model, we quantified responses as vectors of spike counts, one component for each pyramidal cell, either over the full 200 ms inhalation or only the first 50 ms after inhalation onset. We then compared pair-wise correlations between response vectors on either same-odor trials or trials involving different odors. Even though glomerulus onset latencies are identical in all same-odor trials, stochastic mitral cell firing results in considerable trial-to-trial variability (Figure 3D). We found correlation coefficients for same-odor trial pairs over the full sniff to be 0.35 ± 0.010, mean ± SD (for multiple same-odor trial pairs using six different odors). Pairs of model PCx responses to different odors, on the other hand, had correlations of 0.11 ± 0.016; mean ± SD (for pairs from the same six odors), which is significantly lower than same-odor trial correlations. Both correlation coefficients are smaller than what has been measured experimentally (0.48-same, 0.38-different, Bolding and Franks, 2017); 0.67-same, 0.44-different, Roland et al., 2017). A number of factors may contribute to increasing correlations beyond what is seen in the model. Gap junctions between MTCs from the same glomerulus correlate their responses (Christie et al., 2005; Schoppa, 2006), and this would reduce the variability from what the model produces from independent Poisson processes. PCx contains a small subset of broadly activated cells (Zhan and Luo, 2010; Otazu et al., 2015; Bolding and Franks, 2017; Roland et al., 2017) that are likely over-represented in the data, and these increase response correlations to different odorants. Furthermore, although PCx cells can either be odor-activated or odor-suppressed, individual cells mostly retain their response polarity across odors, so that a cell that is activated by one odor is rarely suppressed by other odors, and vice versa (Otazu et al., 2015; Bolding and Franks, 2017), a feature not captured by the model. Finally, the higher correlation values may reflect latent structure in PCx connectivity, either innate or activity-dependent, that increases the correlated activity and is not captured by our model. We next examined how spiking activity of the four different classes of neurons (mitral cells, pyramidal cells, FFINs and FBINs) evolve over the course of a single sniff (Figure 4A). Preceding inhalation, baseline activity in mitral cells drives low levels of spiking in both pyramidal cells and FFINs. FBINs, which do not receive mitral cell input, show no baseline activity. Shortly after inhalation, inputs from the earliest activated glomeruli initiate a dynamic cascade of cortical activity, characterized by a transient and rapid burst of spiking in a small subset of pyramidal cells that peaks ~40 ms after inhalation onset and is then sharply truncated by the strong and synchronous recruitment of FBINs. Pyramidal cell firing rebounds modestly after the synchronous FBIN response, but then the network settles into a sustained state with somewhat elevated pyramidal cell activity that both drives and is held in check by feedback inhibition (Figure 4A). Although more mitral cells respond later in the sniff, cortical population spiking levels are stabilized by slowly increasing activity of FFINs, which cancels the increase in total mitral cell input. This rapid and transient increase in pyramidal cells firing followed by sustained cortical suppression despite continued input from olfactory bulb resembles the population spiking patterns we observed experimentally (Figure 1). What triggers the rapid transient pyramidal cell response? Each odor initially activates a group of glomeruli that project randomly onto different cortical pyramidal cells. A small subset of pyramidal cells receives enough direct input from short-latency mitral cells to reach threshold and start spiking early in the sniff (Figure 4B, cell 1). This activity produces a small amount of recurrent excitation that is dispersed across the cortex via the long-range recurrent collateral connections. The resulting recurrent excitation can recruit other pyramidal cells that receive moderate but subthreshold OB input (Figure 4B, cell 2). However, by itself, recurrent excitation is not strong enough to drive spiking in pyramidal cells that received weak OB input, including from spontaneously active MTCs (Figure 4B, cell 3). Consequently, more pyramidal cells will be activated selectively, resulting in even stronger recurrent excitation. The result is a regenerative increase in total pyramidal cell activity and recurrent excitation. However, recurrent excitation onto FBINs is stronger than onto other pyramidal cells (Stokes and Isaacson, 2010; Suzuki and Bekkers, 2012) so that FBINs are recruited before recurrent excitation alone can activate pyramidal cells that only received weak OB input. Thus, feedback inhibition quickly halts the explosive growth of pyramidal cell firing. Because pure recurrent input always remains subthreshold for pyramidal cells, the odor-specificity of the cortical ensemble is maintained. We sought to reveal the specific roles that different circuit elements play in shaping PCx output and to examine the sensitivity/robustness of our model to changes in its parameters. In these studies, the same odor stimulus was used in all cases, so input from the olfactory bulb is identical except for the trial-to-trial stochasticity of mitral cell spiking. We first compared responses in the full circuit (Figure 4A) with those in a purely feedforward network in which pyramidal cells only receive mitral cell input (Figure 4C). Two key features of PCx response dynamics are different in this highly reduced circuit: first, pyramidal cell spiking increases continuously over the course of the sniff as more glomeruli are activated (Figure 2B); second, the strong initial transient peak in population spiking is lost in the purely feedforward circuit. Intracortical circuitry must therefore implement these features of the population response. We next varied relevant parameters of the intracortical circuitry to determine the role each element of the circuit plays in shaping output. Simply adding FFI to the reduced circuit did not restore the shape of the population response, indicating that FFI does not selectively suppress later PCx activity (Figure 5—figure supplement 1A). Instead, FFI modulates the peak of the population response in the full circuit (Figure 5A). We observe subtle differences, such as more variable pyramidal activity, if we change the strength of the excitatory OB input onto FFINs rather than the FFI itself (Figure 5—figure supplement 1B,C). FFI inhibits both pyramidal cells and FFINs and hence enables the overall amount of inhibition received by pyramidal cells to remain steady across a range of FFI strengths. As the strength of inhibition onto pyramidal cells from a single FFIN increases the recurrent inhibition onto other FFINs increases as well, leading to less active FFINs and hence steady overall inhibition onto pyramidal cells. Model output expressed by pyramidal cell population firing rates for multiple parameter values. The varied parameter is indicated by the red circle in the circuit schematics on left. Each colored trace represents the averaged firing rates (six trials each with four different odors). The legend, with colors corresponding to the traces, indicates the peak IPSP for the parameters generating the traces. Black traces show results using default parameter values. (A) Effect of FFI on pyramidal cell output. Different strengths of FFI correspond to peak IPSP amplitudes of 0, 0.75, 1.5, 2.25, 3, 4.5 and 6 mV (see Materials and methods for conversion to parameter values). FFI primarily controls the amplitude of the peak response. (B) Effect of FBI on pyramidal cell output. Different strengths of FBI corresponsd to peak IPSP amplitudes of 0.25, 0.3, 0.75, 1.5, 2.5, 3, 4.5, 6 and 9 mV. Pyramidal cell output is largely robust to changes in the strength of FBI. However, extremely small values of FBI can lead to runaway excitation (see also Figure 5—figure supplement 1D). (C) Raster plots for pyramidal cells (showing 3000 cells) and FBINs with different amounts of FBI. (i) Peak IPSP amplitude = 0.9 mV. (ii) Peak IPSP amplitude = 3 mV. (iii) Peak IPSP amplitude = 9 mV. Population spike rates are at bottom, with rates for the control case (ii) overlaid in grey for comparison. While the average pyramidal cell rate is robust to different FBI strength, large values of FBI can lead to oscillations. Next, we examined responses when we varied FBI (Figure 5B,C). Runaway excitation occurs when FBI is significantly weakened (magenta traces, illustrated also in Figure 5—figure supplement 1D). Pyramidal cell activity is robust over a large range of FBI values. This is because FBI goes both onto pyramidal cells and other FBINs (via local recurrent inhibitory connections). Similar to FFI, decreasing FBI results in more active FBINs, ultimately resulting in similar total levels of feedback inhibition onto pyramidal cells (Figure 5Ci). Increasing the strength of FBI produces a transient decrease in both the number of active pyramidal cells and active FBIN, again, resulting in similar overall feedback inhibition and pyramidal cells activity. However, unlike FFI, this activity is modulated by oscillations due to the feedback circuit, as the FBINs recruited by pyramidal cells are silenced by the strong inhibition that the recruited FBINs themselves produce (Figure 5Ciii). Thus, total model output is quite robust to the strength of FBIN inhibition, but population spiking becomes oscillatory when this coupling is strongly increased. Finally, we examined how model output depends on recurrent excitation. We first examined odor responses when the strength of recurrent excitation onto pyramidal cells and FBINs were co-varied. Total network activity decreased substantially as recurrent excitation strength increased (Figure 6A), indicating that FBI overrides pyramidal cell recruitment. Although increasing recurrent excitation did not markedly alter overall response dynamics, both the latency and amplitude of the initial peak decreased with stronger recurrent excitation. By contrast, substantially weakening recurrent excitation produced slow, prolonged and more variable responses. Thus, recurrent excitation is responsible for both the early amplification and the subsequent, rapid truncation of the population response. We next examined the effects of changing recurrent excitation onto either pyramidal cells or FBINs independently (Figure 6B). The upward slope to the peak is enhanced by recurrent excitation onto the pyramidal cells, indicating that indeed recurrent excitation is responsible for the recruitment, amplification and rise of pyramidal activity. Accordingly, an increase in its strength gives a higher and earlier peak (Figure 6Bi). In contrast, the recurrent excitation onto FBINs modulates the downward slope of the initial peak, as expected for the circuit component responsible for recruiting the inhibition that truncates pyramidal cells activity. Accordingly, an increase in its strength gives an earlier and lower peak (Figure 6Bii). Model output expressed by pyramidal cell population firing rates using multiple parameter values. The varied parameters are indicated by the red circle in the circuit schematics. Each colored trace represents the average firing rate (six trials each with four different odors). The legend, with corresponding colors, indicates the maximum values of EPSPs onto pyramidal cells and FBINs. Black traces show results using default parameter values. (A) Pyramidal cell population activity with different recurrent collateral couplings. Peak EPSPs onto pyramidal cells of 0, 0.03, 0.05, 0.1, 0.21, 0.32 and 0.42 mV and onto FBINs, 0, 0.13, 0.21, 0.4, 0.85, 1.3 and 1.7 mV. 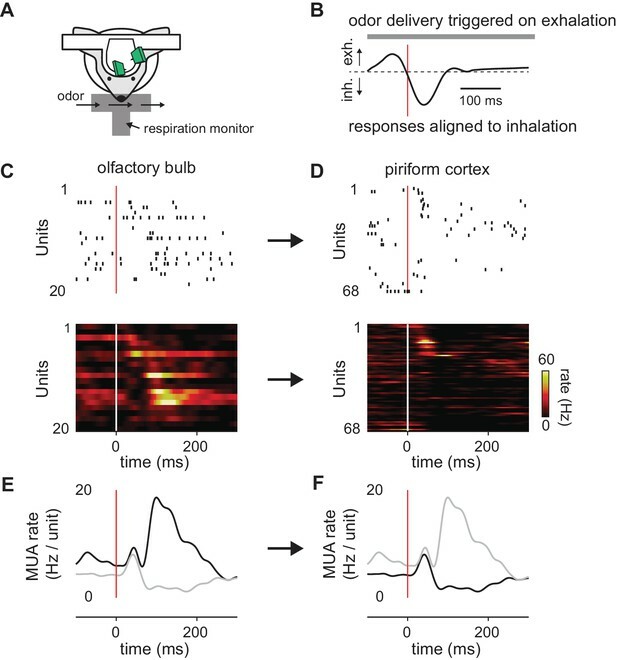 Strong recurrent excitation leads to a stronger initial response but lower activity later in the sniff. Weaker recurrent excitation leads to lower initial response followed by higher and more variable activity. (Bi) Pyramidal cell population activity with different strength recurrent connections onto pyramidal cells only. Peak EPSPs of 0, 0.05, 0.1, 0.13, 0.17 and 0.32 mV. Stronger recurrent connections between pyramidal cells lead to higher and earlier initial response peaks. Even stronger connections lead to runaway pyramidal activity (magenta trace, see also Figure 5—figure supplement 1D). (Bii) Pyramidal cell population activity with different recurrent connection strengths onto FBINs only. Peak EPSPs of 0.13, 0.21, 0.34, 0.4, 0.85 and 1.3 mV. Stronger recurrent connections from pyramidal cells onto FBINs lead to lower, yet earlier initial response peaks. Very weak connections lead to runaway activity (purple trace). The large and early peak in pyramidal cell spiking suggests that early responding glomeruli play an outsized role in defining the cortical odor response. To examine the relative impact of early- versus late-responding glomeruli directly, we compared the rate of population spiking in our model PCx to the sequential activation of individual glomeruli (Figure 7A). In the full network, population spiking peaks 34 ± 8.3 ms after inhalation onset (mean ± SD for six odors with ensemble averages of six trials per odor at the reference concentration; Figure 7B,C). At this time, only 15 ± 1.4 glomeruli have been activated out of the 95 ± 6.0 glomeruli that will eventually be activated across the full sniff. In other words, at its peak, PCx activity is driven by the earliest ~15% of activated glomeruli. Mean responses peak slightly earlier when feedforward inhibition is eliminated (28 ± 4.5 ms; Figure 7B), with peak activity driven by 12 ± 0.80 glomeruli (Figure 7B,C). Population spiking increases much more slowly when recurrent excitation is removed, peaking at139 ± 29 ms, when most of the responsive glomeruli have been activated (66 ± 0.44; Figure 7B,C). Hence, recurrent excitation helps amplify the impact of early-responsive glomeruli and discount the impact of later-responding glomeruli through the recruitment of strong feedback inhibition. We wondered whether the earliest part of the cortical response provides an especially distinctive representation of odor identity. We therefore compared response correlations over either the full 200 ms inhalation or only the first 50 ms after inhalation onset (see Materials and methods for details). Response correlations to both same-odor and different-odor responses were lower when using only the first 50 ms (same-odor, 0.24 ± 0.019; different-odor pairs, 0.044 ± 0.014; Figure 7E). However, the ratio of correlations for same- vs. different-odor responses, which can be thought of as a signal-to-noise ratio, is almost double for responses in the first 50 ms relative to the full 200 ms inhalation (Figure 7F). The cortical odor response is therefore largely shaped by the glomeruli that respond earliest in the sniff. 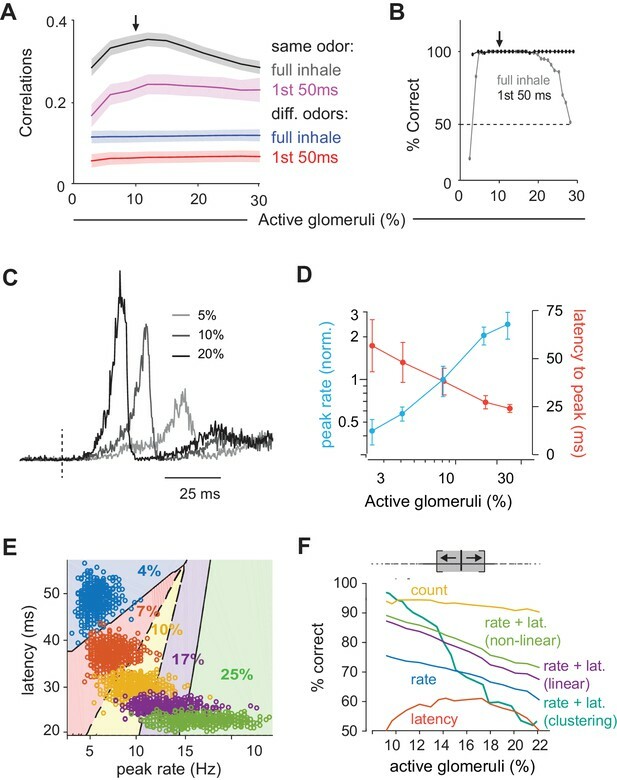 Taken together, our model predicts that a cascade of cortical activity is initiated by the earliest-responsive inputs, amplified by recurrent excitation, and then truncated by feedback inhibition, providing a distinctive odor representation. We next determined how cortical odor representations depend on odorant concentration. Glomerular (Spors and Grinvald, 2002) and MTC onset latencies decrease with increasing concentrations of odorant (Cang and Isaacson, 2003; Junek et al., 2010; Fukunaga et al., 2012; Sirotin et al., 2015). We simulate this in our OB model by scaling the onset latencies from those at the reference concentration (Figure 8A). In other words, to decrease odor concentration, we uniformly stretch latencies, causing fewer glomeruli to be activated within 200 ms, and making those that are activated respond later. Conversely, we shrink the set of latencies to simulate higher concentrations so that glomeruli that were activated later in the sniff at lower concentrations are activated earlier, and some glomeruli that were not activated at lower concentrations become activated at the end of the sniff at higher concentrations. Importantly, stretching or shrinking latencies does not change the sequence in which glomeruli become activated. We quantify odor concentration using the fraction of activated glomeruli. Note that given the nonlinear concentration-dependence of receptor activation and normalization at multiple stages of the system upstream of the cortex (Cleland et al., 2011), a 10-fold increase in mitral cell output corresponds to a much greater range of concentrations. (A) Mitral cell raster plots for 2 odors at three different concentrations, defined by the fraction of active glomeruli during a sniff. Odors are different from the odors in Figure 1. (B) Single-trial piriform response vectors over a concentration range corresponding to 3, 10% and 30% active glomeruli. Note that activity does not dramatically increase despite the 10-fold increase in input. (C) Fraction of activated pyramidal cells at different odor concentrations for the full network (black trace), without FFI (red trace) and without recurrent excitation (green trace) for four different odors (open circles, thin lines) and averaged across odors (filled circles, thicker lines). Note that eliminating FFI primarily shifts the number of responsive cells, indicating that FFI is largely subtractive, whereas eliminating recurrent excitation alters the gain of the response. Note also that recurrent excitation amplifies the number of activated cells at low-odor concentrations. (D) As in C but for the total number of spikes across the population. (E) Distribution of spike counts per cell at different odor concentrations. Data represent mean ± s.e.m. for n = 4 odors at each concentration. The number of responsive pyramidal cells is buffered against changes in odor concentration (Figure 8B). Across the population, we found that the number of responsive pyramidal cells only increases by 80% upon a 10-fold increase in input (mean ±s.d. ; 9.7 ± 0.40% of pyramidal cells respond when 3% of glomeruli are active; 17.3 ± 0.71% of pyramidal cells respond when 30% of glomeruli are active; Figure 8C). This indicates that the size of cortical odor ensembles is only weakly concentration-dependent, which is consistent with experimental observations (Stettler and Axel, 2009; Bolding and Franks, 2017; Roland et al., 2017). In addition, both the total number of spikes across the population (Figure 8D) and the number of spikes evoked per responsive cell (Figure 8E) are only modestly, but uniformly, concentration-dependent. Recent imaging studies indicate that subsets of piriform cells are especially robust to changes in concentration (Roland et al., 2017). It is not yet known how this subset of cells emerges in PCx, and this result is not recapitulated in our model where all cells are qualitatively similar in terms of input, intrinsic properties and local connectivity. Note that we are simulating a situation in which OB output scales very steeply with concentration. In fact, considerable normalization across concentrations occurs within OB (Cleland et al., 2011; Banerjee et al., 2015; Sirotin et al., 2015; Roland et al., 2016; Bolding and Franks, 2017). Nevertheless, this normalization is incomplete. Our model now shows that a relatively simple PCx-like circuit is sufficient to implement this normalization. To gain insight into how normalization is implemented, we again simulated responses at different concentrations, but now either without FFI or without recurrent excitation and FBI. Eliminating FFI increases both the number of responsive cells (Figure 8C) and total population spiking (Figure 8D). However, this increase is fairly modest, uniform across concentrations, and does not substantially change the gain of the response (i.e. the slope of the input-output function). This indicates that the effect of FFI is largely subtractive, consistent with our earlier analysis (Figure 5). In marked contrast, responses become steeply concentration-dependent after eliminating recurrent excitation and FBI, dramatically increasing response gain. Interestingly, cortical output is reduced at low odor concentrations when recurrent excitatory and FBI are removed, indicating that recurrent collateral excitation also amplifies cortical output in response to weak input (Figure 8C,D). Thus, our model demonstrates that a recurrent, piriform-like circuit bi-directionally normalizes graded input by amplifying low levels of activity via recurrent collateral excitation between pyramidal cells and suppressing high levels of activity by recruiting scaled FBI. We quantified response similarity, using spike counts over the full 200 ms inhalation. To do this, we calculated response correlations to an odor at our reference concentration (10% active glomeruli) and compared these to either responses to the same odor (Figure 9A, black curve) or different odors (Figure 9A, blue curve) at different concentrations. Responses to the same odor became more dissimilar (i.e. response correlations decreased) as the differences in concentration increased. By contrast, although responses to different odors were markedly dissimilar (i.e. much lower correlations), these did not depend on concentration. This means that responses to other odors remain more different than same odor responses across concentrations, which could support discriminating between different odors across concentrations. However, these differences become less pronounced at the lowest and highest concentrations. We next asked if a downstream observer can reliably identify an odor using population spiking, and whether the same odor can be recognized when presented at different concentrations. To do this we trained a readout to identify a specific odor at one concentration (10% active glomeruli) and then asked how well it can distinguish that odor from other odors and how well it can identify the trained odor when it is presented at different concentrations (see Materials and methods for details). We first used spike counts over the full 200 ms inhalation as input. Classification was excellent when trained and tested at a single concentration indicating that, despite considerable trial-to-trial variability (Figure 2D), responses to different odors can be distinguished reliably (Figure 9B). We then examined classifier performance when tested on different concentrations without retraining. Consistent with the differences in response correlations, performance was excellent around the training concentration but fell off steeply at the lowest and highest concentrations. Because the sequence of glomerular activation latencies is preserved across concentrations, with the highest affinity glomeruli for a given odorant always activated first, we suspected that the earliest activated glomeruli could provide a more concentration-invariant odor representation of odor identity than the full 200 ms response. To test this prediction, we analyzed early responses by examining spike counts over just the first 50 ms after inhalation. Correlations over first 50 ms were substantially lower than those for the full 200 ms inhale: this was the case for both repeated presentations of the same odor (Figure 9A, magenta curve) as well as for responses to different odors (Figure 9A, red curve). However, as noted previously (Figure 7F), decreasing both sets of correlations increases the ratio of same-odor versus different-odor correlations. Indeed, responses within the first 50 ms contained sufficient information remained for accurate decoding (Figure 9B). And, in contrast to full-inhale responses, classification was not only excellent at and near the training concentration, but across all concentrations tested. This occurs because responses remained similar across concentrations at concentrations above the reference (i.e. response correlations were unchanged), which was not the case with the full, 200 ms responses. Thus, the first 50 ms spike count correlations leave a margin between same and different odor responses across all concentrations, supporting the idea that the earliest cortical response can support concentration-invariant odor recognition (Hopfield, 1995; Schaefer and Margrie, 2012). Finally, we asked how odor intensity could be represented in PCx. To that end, we examined the dynamics of population spiking in response to odors at different concentrations (Figure 9C). The peak amplitude of the population response in our PCx model increases substantially at higher concentrations: a 10-fold increase in active glomeruli (3% to 30%) produces a 5.7-fold increase in peak spike rate (Figure 9D). However, the same concentration range produced a much smaller increase in the number of responsive cells (1.8-fold, Figure 8C) and total spikes (2.1-fold, Figure 8D), indicating that population synchrony is especially sensitive to concentration. Response latencies also decrease at higher concentrations (Figure 9D). These data suggest that either the population spike count, population synchrony or amplitude, timing, or a combination of these, could be used to represent odor concentration. We again used a decoding analysis to test this hypothesis (see Materials and methods for details). For a given odor we simulated 500 presentations at each concentration, across a range of concentrations. We then trained a classifier to distinguish between responses to concentrations corresponding to ±3% active glomeruli above or below the target concentration (Figure 9E), and quantified classification performance with cross-validation. We used peak rate or latency features of the full population peak response for decoding. Performance was better using the peak rate than latency to peak, and even better when we used a combination of rate and latency. Performance improved marginally using a nonlinear (log) decoder. We also decoded using non-parametric clustering (Materials and methods), which performed almost perfectly at low concentrations, but performance deteriorated as concentration increased. Response timing is more variable as concentration is increased (Figure 9E), making it harder to decode based on similarity at large concentrations. Finally, although PCx response rates are buffered, they are not completely insensitive to concentration (a 10-fold increase in OB input results in only a 78% increase in PCx output). Because of their relatively low variability, spike counts can be used for effective concentration classification in our model. Thus, our data suggest that distinct intensity coding strategies may be optimal at different concentrations. However, as noted above, substantial normalization occurs upstream of PCx and total PCx spiking output does not increase with concentration, indicating that spike count is unlikely to be used to encode odor intensity in PCx. Instead, an ‘ensemble-identity’/’temporal-intensity’ coding strategy has recently been observed in PCx in awake mice (Bolding and Franks, 2017). Our model shows how this multiplexed coding strategy can be implemented in a recurrent circuit with the general properties of the PCx. We sought to understand how temporally structured odor information in the OB is transformed in the PCx. A previous study (Sanders et al., 2014) proposed a general scheme for transforming latency codes into ensemble codes, but this model was incompatible with PCx circuitry. We simulated odor-evoked spiking in the OB and used it as input to a PCx network model of leaky integrate-and-fire neurons. Other computational studies have examined how PCx can support oscillatory activity (Wilson and Bower, 1992; Ketchum and Haberly, 1993; Protopapas and Bower, 1998) or auto-associative memory formation (Barkai et al., 1994; Hasselmo and Barkai, 1995; Kilborn et al., 1996; Haberly, 2001); we have not attempted to address these issues. Instead, we show how a PCx-like circuit is sufficient to broadly recapitulate experimental observations, including ensemble codes for odor identity, normalization across odor concentrations, and temporal codes for odor intensity. In doing so, our model provides mechanistic insight into the circuit operations that implement the transformation from a temporal to an ensemble code for odor identity. A given odor typically activates ~10% of neurons distributed across PCx (Poo and Isaacson, 2009; Stettler and Axel, 2009; Miura et al., 2012; Bolding and Franks, 2017; Roland et al., 2017). In brain slices, PCx principal cells (pyramidal and semilunar) require multiple (~6) co-active MTC inputs to reach spike threshold (Franks and Isaacson, 2006; Suzuki and Bekkers, 2006). Our model shows that only a small subset of the total ensemble of responsive PCx neurons need to receive supra-threshold OB input. Because pyramidal cells are connected via long-range recurrent collateral inputs, the few cells that are directly activated by early OB inputs provide diffuse excitatory synaptic input to other cells across PCx. This recurrent excitation brings a larger subset of cells that received moderate, but still subthreshold OB input to spike threshold. This cascade of cortical activity continues until FBINs, which do not receive OB input, are activated. Once activated, FBINs strongly suppress subsequent cortical spiking. This mechanism ensures that the earliest activated glomeruli largely define cortical odor ensembles. Whether and why different types of GABAergic inhibition have subtractive or divisive effects is currently an area of intense interest, including in PCx (Isaacson and Scanziani, 2011). Differences in these types of operations are thought to depend on the types of inhibitory interneurons (e.g. SOM vs. PV cells) and their target sites on the postsynaptic cell (i.e. dendrite- vs. soma-targeting). For example, Sturgill and Isaacson (2015) recently showed that SOM-mediated inhibition in PCx is almost completely subtractive while PV-mediated inhibition is largely divisive. Our model has two types of inhibition, FFI and FBI, that differ from each other only by their connectivity (i.e. place within the circuit) and are otherwise implemented in the same way. Nevertheless, in our model, FFI and FBI play very different roles in transforming OB input, suggesting that the circuit motif to which an inhibitory neuron belongs determines its role, whereas the inhibitory cell type may only have a secondary impact. In particular, we showed that the slope of the population input-output relationship (i.e. gain) is steeper when recurrent excitation/FBI is removed (leaving only FFI), indicating that recurrent excitation/FBI effectively controls gain while FFI is relatively ineffective at doing so (Figure 8). In contrast, gain barely changes when FFI is removed (leaving recurrent excitation/FBI), indicating that FFI’s contribution is predominantly subtractive. This result is different from many models for divisive normalization in sensory systems in which the implementation is through feedforward inhibition (Carandini and Heeger, 2012). This difference may reflect the fact that the period during which the stimulus arrives in the cortex (i.e. the duration of the sniff, here 200 ms) is much longer than the membrane time constant (20 ms) and the time course of synaptic inhibition (10 ms). Thus, a circuit motif in which recurrent excitation drives strong, scaled feedback inhibition may be better suited to normalizing representations in structures that use temporal or latency-based codes, as opposed to those using more instantaneous, rate-code-based inputs. Our model makes a number of experimentally testable predictions. PCx is a highly recurrent circuit in which broad and non-specific GABAergic blockade invariably results in epileptiform activity. 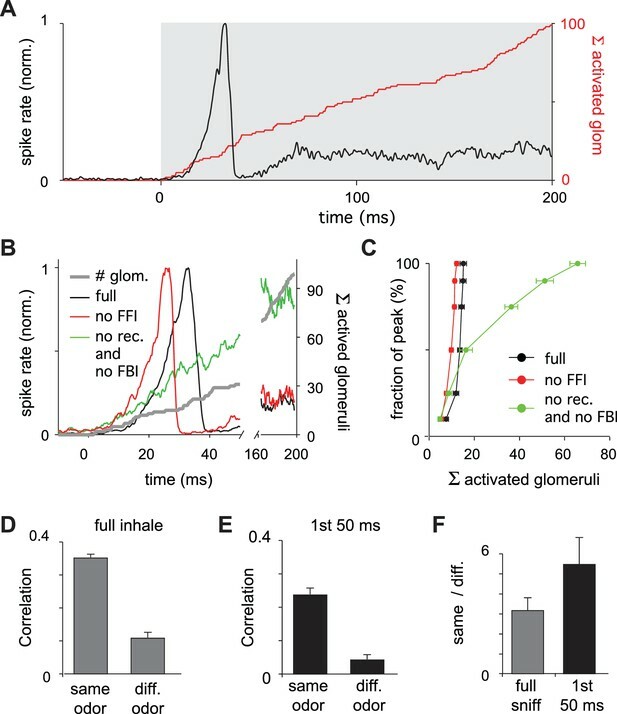 However, our model predicts that selectively blocking FFI should produce an additive increase in response amplitude but not dramatically alter response dynamics. In contrast, selectively and partially blocking FBI should have a large and multiplicative effect. Recent identification of genetic markers for different classes of PCx interneurons (Suzuki and Bekkers, 2010) should facilitate these experiments. In fact, different subtypes of PCx FBINs have been reported to have distinct effects on odor responses (Sturgill and Isaacson, 2015), a result that would require additional cell-types in our model to explain. Interestingly, even though our model predicts that odor responses will be sensitive to partial blockade of excitatory input onto FBINs, it is highly robust to partial blockade of feedback inhibition. Piriform pyramidal cells are interconnected by excitatory recurrent collateral connections. Our model makes the somewhat counter-intuitive prediction that reducing pyramidal cell output will substantially increase and prolong the odor response (Figure 6A). This prediction is motivated by the much greater impact of FBI than FFI on driving the population response. Moreover, blocking pyramidal cell output should make the usually normalized response steeply concentration-dependent (Figure 8C,D). These predictions could be tested, for example, by blocking output using viruses to selectively express tetanus toxin (Murray et al., 2011) in PCx pyramidal cells. Our model also suggests that odor intensity could be encoded in temporal features of the population response. While complicated, psychophysical experiments with optogenetic activation of subsets of PCx neurons could provide a way to test this prediction (Smear et al., 2011). Additionally, we find lower same-odor response correlations than have been observed experimentally. Independent Poisson spiking in mitral cells provides the major source of trial-to-trial variability in our model. However, sister MTCs are connected through gap junctions and often exhibit highly correlated spiking that is entirely absent in Connexin-36 knock-out mice (Christie et al., 2005). Our model predicts that PCx odor responses in Connexin-36 knock-out mice would exhibit more trial-to-trial variability. Finally, pyramidal cells are interconnected randomly in our model. However, this circuitry remains plastic into adulthood (Poo and Isaacson, 2009) and is thought to provide a substrate for odor learning and memory (Haberly, 2001; Wilson and Sullivan, 2011). Selectively interconnecting pyramidal cells that receive common input and are therefore often co-active would decrease trial-to-trial variability. This prediction could be tested, for example, by constitutively eliminating NMDA receptors from pyramidal cells. Bolding and Franks, 2017 observed a biphasic population response in PCx in which some responses are rapid and largely concentration-invariant while others occur with longer latencies that decrease systematically with odorant concentration. The data provided in Figure 1 show similar biphasic responses in both OB and PCx (Figure 1E). This feature is not recapitulated in the model for several possible reasons. First, we modeled a single population of MTCs without distinguishing mitral versus tufted cells. In fact, mitral cells have longer response latencies that decrease at higher odor concentrations, while tufted cells have much shorter response latencies (Fukunaga et al., 2012). Furthermore, we have not modeled centrifugal projections from PCx back to OB (Boyd et al., 2012; Markopoulos et al., 2012; Otazu et al., 2015). The initial peak in PCx firing could drive transient inhibition in OB, which could produce a biphasic response that would better match our experimental observations (Figure 1E). We did not attempt to model, in either OB or PCx, responses that are suppressed below background by odor (Shusterman et al., 2011; Fukunaga et al., 2012; Economo et al., 2016). We have also not attempted to distinguish between different subclasses of principal neurons (e.g. semilunar cells versus superficial pyramidal cells), different types of inhibitory GABAergic interneurons, or more sophisticated neural circuit motifs, such as disinhibition, which has been observed in PCx (Sturgill and Isaacson, 2015; Large et al., 2016). We have also only modeled OB and PCx activity over a single respiration cycle. We justify this simplification based on the observation that highly trained rodents can discriminate between odors (Uchida and Mainen, 2003; Abraham et al., 2004; Rinberg et al., 2006) or odor concentrations (Resulaj and Rinberg, 2015) within a single sniff, indicating that sufficient information must be encoded within that time to represent these features. Nevertheless, odor responses in OB and PCx exhibit pronounced oscillations at beta and gamma frequencies, and representations can evolve over a period of seconds (Kay et al., 2009; Bathellier et al., 2010). These dynamics may be important in more challenging and ethologically relevant conditions. While we note that beta-like oscillatory activity can emerge in our PCx model when feedback inhibition is strong (Figure 5C), we have not incorporated or examined these dynamics in detail here. What information is relevant for cortical odor coding? Our model shows how a PCx-like recurrent circuit amplifies the impact of the earliest inputs and suppresses impact of those that arrive later. This not only normalizes total spiking output, but also enhances odor recognition across concentrations. In fact, we found that a downstream decoder can more accurately recognize odors across a large concentration range when using only early activity. This occurs, in part, because the full (i.e. 200 ms) representation is corrupted by spontaneous activity at low concentrations and contaminated by inputs from late-responding glomeruli at high concentrations. However, it is important to note that, in the model, the sequential activation of glomeruli across the sniff is fully defined. In reality, activation of lower-affinity glomeruli will be far less specific than higher affinity glomeruli, so that input to PCx output becomes increasingly less odor-specific later in the sniff. Our model therefore likely underestimates the advantage of decoding odor identity using the earliest-activated PCx cells. In conclusion, we find that a recurrent feedback circuit can implement a type of temporal filtering of information between OB and PCx in which the earliest-active cells in OB have an outsized role in shaping odor representations in PCx. This transformation supports multiplexed representations of odor identity and odor concentration in PCx. Recurrent normalization has been shown to be particularly effective for controlling the gain in other structures that use phasic or time-varying input (Louie et al., 2014; Sato et al., 2016). Thus, we propose that the transformation of odor information from OB to PCx is an instance of a more widely-implemented circuit motif for interpreting temporally structured input. The model was written in C and compiled using Apple’s xcode environment. The model was run as an executable in OS 10.10+. Runtime for a single trial was approximately 1 s. Source code and an executable model are provided as Supplementary files. The model bulb includes 900 glomeruli with 25 model mitral cells assigned to each glomerulus. For every odor, each glomerulus is assigned a reference onset latency between 0 to 200 ms. The actual glomerular onset latencies for a given concentration are obtained by dividing the set of reference latencies by f, the fraction of glomeuli activated at a particular odor concentration (odor concentrations are defined by the value of f used). Glomeruli with latencies longer than the duration of the inhalation, 200 ms, are not activated. At our reference concentration fref = 10% of the glomeruli have onset latencies < 200 ms. Mitral cell spiking is modeled as a Poisson process that generates action potentials at specified rates; the baseline spike rate is either 1.5 or 2 Hz, this steps to 100 Hz when a glomerulus is activated and then decays back to baseline with a time constant of 50 ms. Poisson-generated mitral cell spiking introduces stochasticity into our olfactory bulb model. The piriform model includes three types of model cells: 10,000 excitatory pyramidal cells, 1225 feedforward inhibitory neurons (FFINs), and 1225 feedback inhibitory neurons (FBINs). The model pyramidal cells and FBINs are assigned to locations on a two-layer grid. Pyramidal cells and FBINs are uniformly spread over the grid on their respective layers. Each pyramidal cell receives an input from 1000 other pyramidal cells and from 50 FFINs, both randomly chosen independent of location. Each pyramidal cell receives local input from the closest 12 (on average) FBINs. Each FBIN receives input from 1000 randomly chosen pyramidal cells and the 8 (on average) closest FBINs. Each FFIN receives input from 50 other randomly chosen FFINs. Each mitral cell sends input to 25 randomly selected cells (either pyramidal cells or FFINs) in the pirifom. As a result, each pyramidal and FFIN receives input from approximately 50 randomly selected mitral cells. Our study focuses on understanding properties of the activity of pyramidal cells because these provide the only output of the piriform cortex. Hence, the connectivity structure is built to replicate the inputs statistics ‘seen’ by the pyramidal cells, as determined experimentally. Here. τm=15 ms is the membrane time constant, Vr is the resting potential and Iiex and Iiin are the excitatory and inhibitory synaptic currents, respectively. We have absorbed a factor of the membrane resistance into the definition of the input currents so they are measured in the same units as the membrane potential (mV). FFINs and FBINs have a resting potential of Vr=-65 mv. Pyramidal cell resting potentials are taken from a Gaussian distribution with mean −64.5 mv and standard deviation 2 mV. When the membrane potential reaches the firing threshold, Vth=-50 mV, the neuron fires an action potential and the membrane potential is reset to a reset value Vreset= -65 mV, where it remains for a refractory period τref= 1 ms. The membrane potential is clamped when it reaches a minimum value of Vmin= -75 mV. The excitatory and inhibitory synaptic currents, Iiex and Iiin, decay exponentially to zero with time constants of 20 and 10 ms, respectively. The excitatory current combines two components, AMPA and NMDA, into a single current. Because the NMDA synapses are relatively slow and AMPA relatively fast, we choose the time constant of this composite current in an intermediate range between these extremes. Each action potential fired by a neuron induces an instantaneous jump in the current of all its postsynaptic targets by an amount equal to the appropriate synaptic strength. Action potentials in FFINs and FBINs affect the inhibitory currents of their postsynaptic target neurons, and action potentials in the pyramidal and mitral cells affect the excitatory currents of their postsynaptic targets. We denote the jump in the synaptic current induced by a single presynaptic action potential by ∆I. It is convenient to give, in addition, the peak postsynaptic potential produced by a single action potential, denoted by ∆V. For a membrane time constant τm and a synaptic time constant τs, the relationship between ∆I and ∆V is ∆V=∆Iτr(ab-ac)/τm where τr= τmτs/(τm - τs), a = τs/τm, b = τr/τm, and c = τr/τs. Except where otherwise noted (figure captions), the values of ∆I for excitatory connections from pyramidal-to-pyramidal, pyramidal-to-FBIN, mitral-to-pyramidal and mitral-to-FFIN are 0.25, 1, 10 and 10 mV, respectively, corresponding to ∆V values of 0.1, 0.4, 4 and 4 mV. The values of ∆I for inhibitory connections from FFIN-to-pyramidal, FBIN-to-FBIN, and FBIN-to-FBIN are all −10 mV, corresponding to a ∆V value of −3 mV. To analyze cortical responses, we define an activity vector r→. Each component of r→ is the number of spikes generated by a pyramidal neuron, starting at the beginning of the inhalation. The spike count continues across the full inhale, or stops after 50 ms in cases when we are interested in the initial response only. The activity maps in the Figures 3D and 8B are a visual representation of the activity vectors created by reshaping the vectors and assigning a color on the basis of their component values. We use a readout defined by a weight vector w→ to classify odor responses to bulb input on the basis of the activity vectors explained above. Our goal is to train the readout so that trials involving a chosen target odor are distinguished from trials using all other odors. Because we generate odors randomly and all model mitral cells behave similarly, the results are independent of the choice of the target odor. Distinguishing the activity for a target odor from all other activity patterns means that we wish to find w→ such that trials with a target odor have w→⋅r→>0 and trials with other odors have w→⋅r→<0. Such a w→ only exists if trials using the target odor are linearly separable from trials using other odors. If such a readout weight vector exists, this indicates that pyramidal cell activity in response to a specific odor is distinguishable from activity for other odors. During training, 100 odors were presented at a specific concentration (10% activated glomeruli) over a total of 600 trials. Odor one was chosen as the target, and the trials alternated between this target odor and the other odors. Thus, odor 1 was presented 303 times and every other odor three times. On every trial, the quantity w→∙r→ was calculated, with r→ the activity vector for that trial and w→ the current readout weight vector. Initially, w→ was zero. If classification was correct, meaning w→⋅r→>0 for the target odor or w→⋅r→<0 for other odors,w→ was left unchanged. Otherwise w→ was updated to w→+r→ or w→-r→ for trials of odor one or for other odors, respectively. The entire training procedure was repeated twice, once with activity vectors that included spikes counts around the peak of the piriform activity (the first 50 ms inhale) and once using spikes counts from the entire inhalation. To test the readout, each odor was presented at many concentrations (even though training was done for only one concentration). For the target odor, 100 trials were tested at each concentration (30 different concentrations ranging between 3% activated glomeruli to 30% activated glomeruli). Each trial that gave w→⋅r→>0 for the test odor was considered a correct classification. For each concentration, the percentage of trials that were correctly classified was calculated. Trials with non-target odors were tested as well, one trial for each odor at each concentration. All the non-target odors were correctly classified as not target (w→⋅r→<0) across all concentrations. The testing procedure was done using both the peak and full activity vectors, using the corresponding readout weight vectors. We used the pyramidal cell peak rate responses to identify the concentration of bulb input. In each trial, pyramidal activity was characterized using two quantities, the rate of activity at the peak of response, rpeak, and the latency to the peak of the response from inhalation onset, tpeak. We recoded these two features for 500 trials of a target odor in 27 concentrations, spaced equally between 3% and 27% active glomeruli (500*27 trials in total). Because we are interested in understanding whether a concentration can be identified from peak properties for a specific odor, all trials used a single target odor. As explained above, since we generate odors randomly and all model mitral cells behave similarly, the results are independent of the choice of the target odor. For all of our classification methods, 250 trials at each concentration were used for training the classifier and the remaining 250 trials were used for testing. Because identifying the number of active glomeruli that drives the response depends on the differences between the percentages of active glomeruli (small differences are harder to detect) we chose to train and test responses within ±3% of active glomeruli relative to the target concentration. This is small enough (one tenth of the full studied range) to show identification of concentration from peak properties and large enough to allow for training and testing. Classification based on peak rate, rpeak: For each target concentration we determined a value of rc that optimally separates our training set of lower concentrations, with rpeak<rc, from those with higher concentration and rpeak>rc. We then measured the percentage of trials from our testing set that were classified correctly using this value of rc. Classification based on peak latency, tpeak: The classification procedure was similar to (1), except that we determined tc (instead of rc) to distinguish lower concentrations with tpeak>tc from higher concentration with tpeak<tc. Linear classification based on peak rate, rpeak, and peak latency, tpeak: Similar to (1), except we searched for two parameters, ac and bc (by searching exhaustively in the plane) such that the line t=acr+bc separated lower concentrations with tpeak>acrpeak+bc from higher concentration with tpeak<acrpeak+bc. Non-linear (log) classification based on peak rate, rpeak, and peak latency, tpeak: Similar to (3), except that we searched for a separating line of the form t = ac log⁡(r-bc). Clustering: For a pair of peak rates and latencies (rpeak, tpeak) from each test trial, we calculated all the (Euclidian) distances to pairs from all training trials. The concentration assigned to a test trial corresponded to the minimum average distance from training trials at that concentration. If the assigned concentration was within 4% of active glomeruli from the correct percentage of active glomeruli, the classification was considered correct. For each concentration, we calculated the percentage of test trials that were assigned correctly. Classification based on spike counts, stotal: Classification was done as in (1) using the total number of spikes emitted by the full pyramidal population (independent of any peak property), with a value sc that separated lower concentrations with stotal<sc from higher concentrations with stotal>sc. All experimental protocols were approved by Duke University Institutional Animal Care and Use Committee. The methods for head-fixation, data acquisition, electrode placement, stimulus delivery, and analysis of single-unit and population odor responses are adapted from those described in detail previously (Bolding and Franks, 2017). Mice were adult (>P60, 20–24 g) offspring (four males, two females) of Emx1-cre (+/+) breeding pairs obtained from The Jackson Laboratory (005628). Mice were singly-housed on a normal light-dark cycle. Mice were habituated to head-fixation and tube restraint for 15–30 min on each of the two days prior to experiments. The head post was held in place by two clamps attached to ThorLabs posts. A hinged 50 ml Falcon tube on top of a heating pad (FHC) supported and restrained the body in the head-fixed apparatus. Electrophysiological signals were acquired with a 32-site polytrode acute probe (A1 × 32-Poly3-5mm-25s-177, Neuronexus) through an A32-OM32 adaptor (Neuronexus) connected to a Cereplex digital headstage (Blackrock Microsystems). Unfiltered signals were digitized at 30 kHz at the headstage and recorded by a Cerebus multichannel data acquisition system (BlackRock Microsystems). Experimental events and respiration signal were acquired at 2 kHz by analog inputs of the Cerebus system. Respiration was monitored with a microbridge mass airflow sensor (Honeywell AWM3300V) positioned directly opposite the animal’s nose. Negative airflow corresponds to inhalation and produces negative changes in the voltage of the sensor output. For piriform cortex recordings, the recording probe was positioned in the anterior piriform cortex using a Patchstar Micromanipulator (Scientifica, UK), with the probe positioned at 1.32 mm anterior and 3.8 mm lateral from bregma. Recordings were targeted 3.5–4 mm ventral from the brain surface at this position with adjustment according to the local field potential (LFP) and spiking activity monitored online. Electrode sites on the polytrode span 275 μm along the dorsal-ventral axis. The probe was lowered until a band of intense spiking activity covering 30–40% of electrode sites near the correct ventral coordinate was observed, reflecting the densely packed layer II of piriform cortex. For simultaneous ipsilateral olfactory bulb recordings, a micromanipulator holding the recording probe was set to a 10-degree angle in the coronal plane, targeting the ventrolateral mitral cell layer. The probe was initially positioned above the center of the olfactory bulb (4.85 AP, 0.6 ML) and then lowered along this angle through the dorsal mitral cell and granule layers until a dense band of high-frequency activity was encountered, signifying the targeted mitral cell layer, typically between 1.5 and 2.5 mm from the bulb surface. Individual units were isolated using Spyking-Circus (https://github.com/spyking-circus). Clusters with >1% of ISIs violating the refractory period (<2 ms) or appearing otherwise contaminated were manually removed from the dataset. Pairs of units with similar waveforms and coordinated refractory periods in the cross-correlogram were combined into single clusters. Unit position with respect to electrode sites was characterized as the average of all electrode site positions weighted by the wave amplitude on each electrode. Temporal Coding in Olfaction, The Neurobiology of Olfaction, Boca Raton, Taylor and Francis Group. The Journal of Neuroscience : The Official Journal of the Society for Neuroscience 23:4108–4116. Journal of Cognitive Neuroscience 8:328–343. Philosophical Transactions of the Royal Society B: Biological Sciences 369:20120467. In: J. M Bower, editors. GENESIS: Exploring Realistic Neural Models with the GEneral NEural SImulation System. New York, NY: Springer and D. Beeman. pp. 149–168. Frontiers in Computational Neuroscience 8:108. Frontiers in Computational Neuroscience 10:107. Thank you for submitting your work entitled "A transformation from temporal to ensemble coding in a model of piriform cortex" for consideration by eLife. Your article has been reviewed by three peer reviewers, and the evaluation has been overseen by a Reviewing Editor (Naoshige Uchida) and a Senior Editor. The reviewers have opted to remain anonymous. The authors explore the neural circuit mechanism underlying the transformation of odor information from the olfactory bulb (OB) to the piriform cortex (PCx) using a large scale spiking network model of the PCx. The model consists of a large number (>10,000) of integrate-and-fire neurons with current-based synaptic inputs, incorporating spike-latency based OB input, feedforward inhibitory neurons (FFI), feedback inhibitory neurons (FBI), and recurrent excitation. First, the authors show that the model can reproduce responses resembling those observed in experiments in terms of sparseness, temporal pattern, as well as concentration-dependent shift in peak timing and size. The authors show that PCx neurons responded with transient response followed by less active state. Because of this, a short latency OB input has larger impacts on PCx responses compared to a later OB input. By examining how each circuit element contributes to shape the dynamics of odor responses, the authors show that FBI and recurrent excitation play important roles in generating the transient PCx response dynamics. The reviewers found that this manuscript addresses potentially important questions, and might provide interesting results. However and critically, they were unsure what the specific take home messages of the study are. They questioned: What can we really learn about the PCx from a seemingly generic circuit model that has omitted various known features of the PCx (e.g. see the reviewer 2's comments)? Is there anything that is not expected from the way that the model was designed? How robust the conclusions are to variations in the model parameters? The reviewers thought that the manuscript needs to be much improved with respect to these points. Below we summarize the essential points reflecting also our discussion sessions in addition to the individual comments appended further below. Please note that individual comments (especially, those from reviewer 2) contain many important points to which we would like the authors to consider. We are happy to look at a revised manuscript as far as the authors can fully address the essential points. Please note again, however, that the reviewers raised substantive concerns and it is critical that the authors address the essential points. In particular, please make sure to make a better use of modeling that allows the authors to draw well-constrained, novel conclusions. 1) Throughout the manuscript, the authors need to be more explicit about (i) what the exact observations are that need explanation, (ii) what the assumptions are they are making and (iii) what they find and conclude. Reviewer 2 mentioned that "most of the conclusions within Results paragraphs are of this nature – the sort of throwaway interpretive comments that often fill the tail ends of Discussion sections. The value of modeling is to quantify and/or challenge hypotheses that are not simple enough to be otherwise obvious. Modeling results deserve and require the same critical assessment as experimental results – do they really mean what they seem to, or are there extraneous variables that dominate the outcome? Are we predetermining the outcome by the way in which we set up the experiment, bypassing the actual question of interest?" The reviewers think that these points need to be addressed very clearly. 2) Related to the above issue, the reviewers are concerned whether the conclusions that the authors make are robust. Reviewer 1 mentioned that "While it seems that simple circuit features are enough to explain core features of the observed physiology (to be spelled out more explicitly, see above), the authors do not provide any evidence that indeed their findings are robust against variations in the (large number of) parameters they need to put into their model. One way to test this would be to somehow reduce their main findings to a few key output values (e.g. peak of firing rate with and without recurrent / FBI, late/early firing rate for FF only vs control, same/diff ratio as in Figure 5F and various other parameters extracted from their core findings) and assess, how robust these parameters are against variations in model parameter. Without such analysis it is difficult to assess how fundamental their findings are". Reviewer 2 raises a similar concern, and provides some ways to address this issue with respect to normalization: "But, setting that aside, what do we learn from the present model? The authors favor FBI as the main normalizing force, which is fine. But this isn't really a finding. First, 'normalization' implies FBI, as you can't truly normalize without feedback. However, nominal FFI circuits often embed feedback effects, as do those in the present model in which broad MC->FFI projections and FFI-FFI interconnectivity are likely to produce some sort of global quasi-average activity level among FF interneurons for delivery onto PCx pyramidal cells that can serve as quasi-normalization so long as the gains are roughly matched. But more to the point, to conclude that FBI is the dominant effect requires exploration of the parameter spaces. Under what circumstances is this so? What if FBI were weaker, and FFI stronger? What if FFI were sigmoidal in effect and very strong, so that it reliably constrains PCx activation within a narrow range? How about some assessment of the innate requirement for both, because tuned FFI ensures that the pyramidal cells can respond within their dynamic ranges whereas FBI can further tune Pyr cell activity (surely for more interesting purposes that fine-tuning concentration normalization, though)". Overall, we would like the authors to demonstrate more explicitly throughout the manuscript that each conclusion is not a trivial consequence of the particular way the model was built (or the particular combination of parameters picked). 3) Reviewer 2 mentioned that "The interpretation (finding?) that FFI is subtractive is particularly baffling – of course it is so in the model, because the authors' LIF inhibitory synapses are subtractive. The GABA(A) synapses in the actual PCx will be predominantly divisive". Because the integrate-and-fire model used in this study uses subtractive voltage changes by synaptic inputs, it is likely that some of the subtractive nature of firing in the model is a direct consequence of this property of the model. The authors should make a strong case why this observation is interesting. 4) There was some disagreement among the reviewers as to what details need to be incorporated into modeling. These include oscillations at the β and γ frequencies, OB-PCx interactions and important properties or functions of the olfactory circuit. During discussion, we agreed that OB-PCx interaction is beyond the scope of the study. Nonetheless, there appear to be some ways to test the impact of oscillations such as entraining OB input with varying levels of oscillations. For other factors, we would like the authors to discuss how some of the omitted features may or may not affect their main conclusions. 6) Figure 4. The case without just recurrent excitation is lacking in the simulation (the case without just feedback inhibition is described in the text and this is fine). Because "no recurrent excitation" condition is explored in Figure 5, providing the result of simulation under this condition is important. Also, it seems inconsistent that the authors go back to examine the "no recurrent excitation and no feedback inhibition" condition in Figure 6. Related to this, the description in the text and the figure legend is not matching. The text says that the condition is "no recurrent excitation and no feedback inhibition" but the legend for Figure 6 says "no recurrent excitation". To display the results of both cases, it is clearer to use different colors for these two conditions. 7) Figure 6. Panel C shows the percent of responding cells and panel D shows total spikes generated by the entire population. These together seem to indicate that the spike count of individual pyramidal neurons does not change much with concentration, but this is unclear. It is useful to present the distribution of spikes in individual neurons. This is also necessary to support the notion: "…, indicating that population synchrony can provide a robust representation of odor concentration". To state that synchrony is enhanced, we need to know that the rate of individual neurons is not changed. 8) "Thus, the early peak in the PCx response can be used to rapidly decode both odor identity and concentration". The data supporting this conclusion is not supplied in the manuscript. The authors need to perform decoding using the peak rate. Also, although the text in the first paragraph of the subsection “Strategies for encoding odor intensity” says that the concentration-dependent change in latency to peak was modest, Figure 7B shows a substantial change and this is one of the major conclusions of the recent physiological study conducted by the authors (Bolding and Franks, eLife (2017)). Therefore, it is recommended to perform decoding using the latency to peak as well and compare the result with that using the peak rate. The original review comments are appended below. It contains further elaborations of the issues summarized above. Please take these comments into account when you prepare a revision. This manuscript by Franks et al. presents a large-scale model of pcx incorporating OB input, FFI, FBI and recurrent excitation. It is very well written and aims to demonstrate that already the core features of PCX circuitry (as spelled out above) can explain key physiological observations, namely the reformatting of activity from OB to PCX as observed in in vivo physiology experiments. So, for me the main conclusion of the paper is that no "magic", i.e. unknown cell types or circuit motifs or complex temporal dynamics are needed to explain the reformatting from OB activity to PCX activity. 1) While spelled out quite nicely in the last paragraph of the Introduction and in the first paragraph of the Discussion, the authors need to be even more explicit about (i) what the exact observations are that need explanation, (ii) what the assumptions are they are making and (iii) what they find and conclude. Most of this is there in the text but clarity and bullet points in Introduction and Discussion would help to gauge the quality and the far-reaching implications of their conclusions. 2) While it seems that simple circuit features are enough to explain core features of the observed physiology (to be spelled out more explicitly, see above), the authors do not provide any evidence that indeed their findings are robust against variations in the (large number of) parameters they need to put into their model. One way to test this would be to somehow reduce their main findings to a few key output values (e.g. peak of firing rate with and without recurrent / FBI, late/early firing rate for FF only vs control, same/diff ratio as in Figure 5F and various other parameters extracted from their core findings) and assess, how robust these parameters are against variations in model parameter. Without such analysis it is difficult to assess how fundamental their findings are. 3) While the authors show that the simple PCX circuitry is capable of reproducing many observed features they don't make explicit predictions. I guess Figure 4 does contain implicit predictions about the role of the different network components but it would be very helpful and substantially strengthen the manuscript if these were made explicit in the Discussion. Obviously, direct experimental data to test the role of e.g. recurrent / feedback circuits or FFI would massively strengthen the conclusions. I looked forward to reading this paper. Senior author Franks is an emerging force in the systems neurophysiology of piriform cortex who has earned respect from his colleagues, including myself, for his independent work. Joint senior author Abbott is a computational neuroscientist of the first rank. Respect to the first authors as well for their acceptance into these mentors' labs; I will look forward to their future work. But this manuscript is not something that any of these authors will want on their conscience. It is a loosely-vetted and ultimately generic set of simulations based on substantial apparent ignorance of the underlying systems and of the value and limitations of computational modeling as a research strategy. It is likely to have value as a starting point for computational exploration of the system, but none of the present findings offer insight; they are simple, deterministic outcomes of the LIF circuit motifs used, with all of the interesting and mysterious features of piriform cortex explicitly omitted from the study. The concrete goals of the model are unclear, but the title indicates that the central finding is a transformation from temporal to ensemble coding, referring here to an emphasis on sequences of activity in OB generating characteristic 'spatial' activity patterns across PCx pyramidal neurons. To do this, the authors built a randomly connected network between LIF neurons labeled MCs and another labeled PCx pyramidal cells, plus two classes of PCx interneurons. The MC-PCx mapping determines an ensemble-to-ensemble transformation, with the 'temporal' aspect contributing by spreading out MC activity in time so that only the earliest activated MCs constitute the relevant 'ensemble'. The suppression of PCx pyramidal responses by FBIs contributes to this temporal selectivity, as later-activating MCs have a much reduced field of excitable PCx neurons to activate. Probably this effect would be even stronger if PCx pyramidal activity was scored within the first volley rather than over the full 200 ms stimulation (including after the rebound from FBI inhibition), but that's a detail. This is fine so far – a simple implementation of well-known response properties in PCx that could be a foundation for interesting further development. But most of what the authors proceed to at this point is just to activate this simple LIF circuit motif in straightforward ways and claim, implausibly, that they have learned something about the piriform cortex. For example, there is the issue of timescale. The olfactory bulb is one of the canonical oscillogenic circuits of the brain, generating endogenous γ rhythmicity from unpatterned (or theta-patterned input arising from respiration and/or ET cell dynamics) input. OB-PCx interactions are coordinated in the β band, which supersedes γ via a transitional mechanism that remains unclear. These γ/β frequencies are generally the frequencies considered relevant for spike phase coding effects, as received and transformed by postsynaptic integration and plasticity mechanisms such as STDP. On the order of ten different labs over the years have dedicated substantial effort to measuring, analyzing, and understanding these fast OB (and to a lesser extent PCx) dynamics, both physiologically and in a coding sense. Many more groups pursue analogous neuronal systems dynamics questions in other structures, particularly hippocampus. Yet, in recent years, a corner of the olfaction literature has arisen that seems to not understand this body of work, or the relevance of the dynamical systems that underlie it, and has instead borrowed key concepts and catchphrases from this body of work and applied them naively to respiratory theta "oscillations". The deployment of citations in the introduction to this paper suggests that the authors are among those who do not understand this distinction, or appreciate its importance. For a dynamically-based model to simply omit mention of the central dynamics of this system is disqualifying. It renders the essential premise being tested in this paper incorrect and the outcome of the associated model all but irrelevant. This would be a critical problem even if the rest of the authors' approach was defensible. This criticism may sound strange, because the Introduction is full of citations that, if skimmed, might appear to loosely support the premise constructed if one knew nothing of the literature omitted. But upon closer and more critical reading, the constructed premise does not stand. For example, some references note phenomenological responses as a side point to the chief goals of the corresponding paper. This manuscript uncritically interprets such reports as broadly vetted truths that will withstand the vagaries of sensory sampling in natural environments, even when a rudimentary understanding of physiological principles would make the error clear. Sometimes the reference in question bears responsibility for the error by overgeneralizing their findings or indulging a favorite hypothesis. Sometimes not. But the naïve rank-based temporal sequence hypotheses on the theta timescale for odor coding don't pass the sniff test. Response replicability under tightly controlled conditions is a deterministic near-tautology; it does not suffice to defend a hypothesis of coding. The entire central problem of olfaction is signal identification in the presence of copious and usually unpredictable noise; we know that virtually no easily-recognizable aspect of the signal is replicable in competing backgrounds, or in awake, behaving animals. But if we ignore the timescale issue and accept the hypothesis of spike rank coding on a respiratory timescale (for sake of argument), along with the convergence and divergence of MC->Pyr connectivity, what will this offer us? The interesting features of PCx are its intrinsic dynamics, its emergent shared dynamics with OB, its hypothesized pattern-completion capabilities, and the idea that it may be a primary location for the integration of afferent odor input with existing odor memories. However, all of these are explicitly excluded from consideration by the present authors. This is problematic, because any one of these features, if implemented, would substantially dominate the core response properties of the piriform cortex to afferent input. Omitting all of them essentially predetermines that the outcome of the simulation will be irrelevant to any application. Constructing the model explicitly from LIF neurons further rules out the possibility of finding interesting biophysical mechanisms underlying PCx response properties. But if we set these difficult problems aside, knowing that simulations also can serve as test beds for emergent circuit properties that may help us understand these more complex hypothesized functions, then what questions can the remaining model help us address? 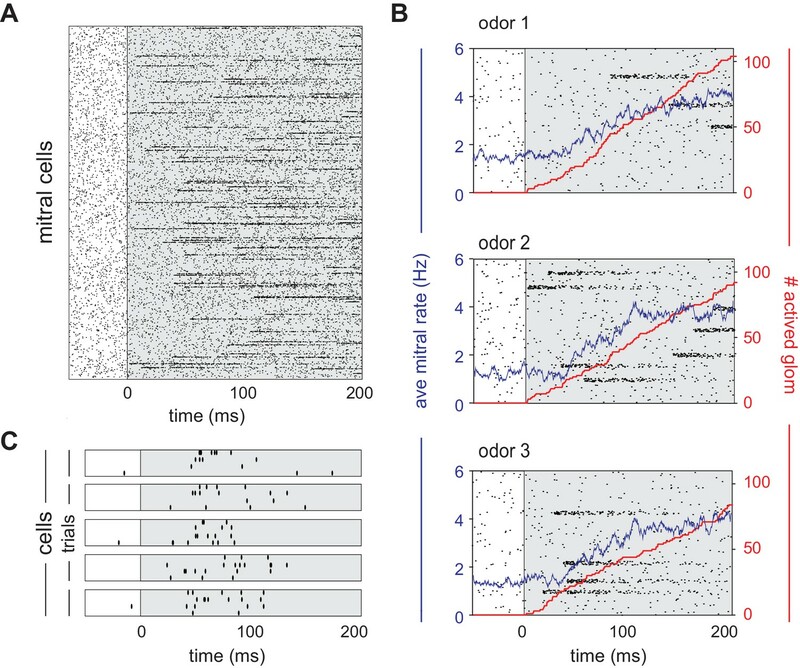 The authors answer (1) explaining spatially distributed ensemble codes for odor identity, (2) normalization across odor concentrations, and (3) the revelation of temporal codes for odor intensity. Spatially distributed ensemble codes have been shown experimentally, of course. In the present model, the transform is essentially predetermined… different odors are defined by their different profiles of activation across glomeruli, and latencies of each. The divergence/convergence pattern onto PCx generate odor-specific patterns among PCx neurons: a generic spatial transform. This isn't a finding; it has been a foundational principle for decades. The selectivity for early MC responses is an idea, presumably motivated by rapid behavioral responses and fast functional adaptation in PCx pyramidal cells. I suppose hypothesizing that FBI feedback is primarily responsible for PCx pyramidal neuron response adaptation is potentially of interest, but this would need to be developed further. "Thus, while our simplified PCx-like model does recapitulate the overall pattern of odor ensembles across PCx, ways in which it fails to do so makes specific predictions about cortical connectivity." This statement is fundamentally untrue. The model doesn't match the data, and the authors have some vague ideas about model limitations vis a vis reality that might bear on the difference. These aren't "specific predictions", especially because no effort at all is made to explore them. I'm not going to repeat myself more, but most of the conclusions within Results paragraphs are of this nature – the sort of throwaway interpretive comments that often fill the tail ends of Discussion sections. The value of modeling is to quantify and/or challenge hypotheses that are not simple enough to be otherwise obvious. Modeling results deserve and require the same critical assessment as experimental results – do they really mean what they seem to, or are there extraneous variables that dominate the outcome? Are we predetermining the outcome by the way in which we set up the experiment, bypassing the actual question of interest? This is really important to understand if one wants to be a consequential theoretical neuroscientist. Normalization across odor concentrations. In sensory systems, it's just not reasonable to insert the main afferent intensity tolerance circuitry after the second synapse. Indeed, the authors acknowledge that most of this takes place earlier, substantially in the OB glomerular layer. But of course cortical circuits (almost?) all regulate local circuit input intensities, presumably because of the narrow dynamic ranges of neurons and the often narrower ranges of functional circuits. So it's not strictly wrong to refer to FFI and FBI in the PCx circuit as concentration normalization, but I would call it misleading. If you have negative feedback, then you have a capability that you could call 'intensity normalization' if you set up an experiment to show you that and had narrative reasons to call it that. But this is really different from a claim of "concentration normalization" in a chemosensory system. But, setting that aside, what do we learn from the present model? The authors favor FBI as the main normalizing force, which is fine. But this isn't really a finding. First, 'normalization' implies FBI, as you can't truly normalize without feedback. However, nominal FFI circuits often embed feedback effects, as do those in the present model in which broad MC->FFI projections and FFI-FFI interconnectivity are likely to produce some sort of global quasi-average activity level among FF interneurons for delivery onto PCx pyramidal cells that can serve as quasi-normalization so long as the gains are roughly matched. But more to the point, to conclude that FBI is the dominant effect requires exploration of the parameter spaces. Under what circumstances is this so? What if FBI were weaker, and FFI stronger? What if FFI were sigmoidal in effect and very strong, so that it reliably constrains PCx activation within a narrow range? 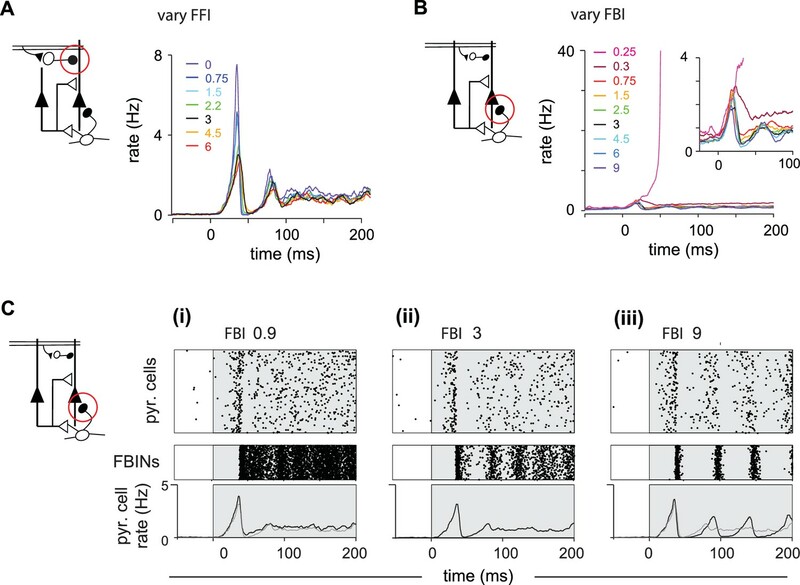 How about some assessment of the innate requirement for both, because tuned FFI ensures that the pyramidal cells can respond within their dynamic ranges whereas FBI can further tune Pyr cell activity (surely for more interesting purposes that fine-tuning concentration normalization, though). The interpretation (finding?) that FFI is subtractive is particularly baffling – of course it is so in the model, because the authors' LIF inhibitory synapses are subtractive. The GABA(A) synapses in the actual PCx will be predominantly divisive. It's a bug, not a feature. The revelation of temporal codes for odor intensity I can't speak to. The effects emerge from a model that is missing most of the important features that would affect this finding, and that is not challenged by odor competition, correlated noise, or difficult discriminations. In the present model, this finding is an unavoidable consequence of the deterministic system and the particular models used for concentration (whether altering the number of glomeruli activated or stretching/compressing their activation in time). The model isn't constrained by olfactory physiology anywhere near well enough to generalize this effect to the real system. Overall, this model is a generic spatial-to-spatial transformation circuit model with a temporal selectivity element added on. It is loosely based on the synaptology of piriform cortex (in the sense that it lumps several classes of neurons into larger groups) but dominated by standard FF and FB circuit motifs. Few surprises are possible because of the simple LIF models and straightforward connectivity maps. Diversity in cell types, biophysical properties, and the main interesting features of piriform cortex are omitted by design. So what is the point of the model? Just to reshape the odor representation again into a new form? We know that already, both from PCx data and from what randomly connected layers of LIF neurons do. What is the utility of this transformation? The experiments associated with Figure 3 have the most potential; they start engaging with the dynamics of PCx circuitry. But there is a lot to do to actually assess the potential roles of these different interneuron classes, as opposed to generating a just-so story. I want to be supportive of this work; I genuinely do. But to be supportive of the authors, which is ultimately more important, I instead offer this fairly harsh review. I'm sorry for that, but it is necessary. The aim of the manuscript was to understand the mechanisms underlying transformation of olfactory representations from the olfactory bulb (OB) to the piriform cortex (PCx) by creating a network model of PCx and manipulating each element of the network. First, the authors show that the model pyramidal neurons receiving odor-dependent variable-latency OB input can produce responses resembling those observed in experiments in terms of sparseness, temporal pattern, as well as concentration-dependent shift in peak timing and size. Then they simulate how each circuit element contributes to shape the dynamics of odor responses. Simulation indicated that the early OB input has a larger voice in generating the phasic excitatory response and this requires recurrent excitation and inhibition. Recurrent excitation was also shown to be central for more concentration-invariant odor representations in pyramidal neurons. This is a solid modeling study that can guide future efforts to better understand the circuit mechanisms of olfactory computations in the PCx. The level of the model seems to be adequate to address the specific aims and limitations of the model are also acknowledged. However, I have several issues that need to be addressed to fully support some of the authors' statements and to remove one inconsistency. 1) Figure 4. The case without just recurrent excitation is lacking in the simulation (the case without just feedback inhibition is described in the text and this is fine). Because "no recurrent excitation" condition is explored in Figure 5, providing the result of simulation under this condition is important. Also, it seems inconsistent that the authors go back to examine the "no recurrent excitation and no feedback inhibition" condition in Figure 6. Related to this, the description in the text and the figure legend is not matching. The text says that the condition is "no recurrent excitation and no feedback inhibition" but the legend for Figure 6 says "no recurrent excitation". To display the results of both cases, it is clearer to use different colors for these two conditions. 2) Figure 6. Panel C shows the percent of responding cells and panel D shows total spikes generated by the entire population. These together seem to indicate that the spike count of individual pyramidal neurons does not change much with concentration, but this is unclear. It is useful to present the distribution of spikes in individual neurons. This is also necessary to support the notion: "…, indicating that population synchrony can provide a robust representation of odor concentration". To state that synchrony is enhanced, we need to know that the rate of individual neurons is not changed. 3) "Thus, the early peak in the PCx response can be used to rapidly decode both odor identity and concentration". The data supporting this conclusion is not supplied in the manuscript. The authors need to perform decoding using the peak rate. Also, although the text in the first paragraph of the subsection “Strategies for encoding odor intensity” says that the concentration-dependent change in latency to peak was modest, Figure 7B shows a substantial change and this is one of the major conclusions of the recent physiological study conducted by the authors (Bolding and Franks, eLife (2017)). Therefore, it is recommended to perform decoding using the latency to peak as well and compare the result with that using the peak rate. We now provide experimental data (new Figure 1) that show how odor information is transformed from OB to PCx. Specifically, we show that while individual MTCs respond at different phases of the sniff cycle, most responsive neurons in PCx spike shortly after inhalation. This result indicates that early-responsive MTCs play a dominant role in driving PCx output, and that the impact of later-responding MTCs is suppressed in PCx. The goal of this study is to understand the neural circuit processes that implement this transformation. We show that a simplified PCx circuit can do this with, as reviewer 1 says, ‘no magic’. In summary, we show that, and how, recurrent excitation and feedback inhibition play a major role in implementing this transformation. We have now made this goal more explicit up front, and we have been more clear about the assumptions we make to arrive at our conclusion and how these assumptions may influence the interpretation of our results. We agree with reviewer 2 that modeling studies can be valuable for “quantifying and/or challenging hypotheses that are not simple enough to be otherwise obvious”. However, modeling studies can also be valuable in demonstrating the sufficiency of simple solutions to potentially complicated problems. Our study falls into this latter category. Following reviewer 1’s suggestion, we used population firing rates to examine the robustness while varying vales of many of the model’s key parameters. These analyses demonstrate that our model is robust over a reasonable range of parameter values, as well as identify the parameters to which the model is most sensitive. These analyses have also yielded some additional novel and interesting results which we elaborate in the text. As one example, we originally said that runaway excitation occurs when FBI is removed and recurrent excitation is left in place. However, FBI is disynaptic, with an excitatory connection from pyramidal cells onto FBI neurons and an inhibitory connection from FBI neurons back onto pyramidal cells. Completely eliminating either indeed produces runaway excitation. However, changing these two variables has quite distinct effects on the population response. Gradually varying the strength of connections from pyramidal cells into FBI neurons produces a corresponding gradual change in the pyramidal cell spiking, as we expected. However, pyramidal cell population spiking is largely robust to changes in FBI. This occurs because a small increase in FBI strength silences more FBI neurons (since they are also interconnected) resulting in fewer active FBI neurons, which stabilizes the overall amount of output inhibition into the pyramidal cells. However, we did notice that as FBI gets stronger, pyramidal cell output become synchronized at ~20 Hz. We discuss these results further in response to Essential point no. 4. Whether and why different types of GABAergic inhibition have subtractive or divisive effects is currently an area of intense interest, including in PCx. Differences in these types of operations are thought to depend on the types of inhibitory interneurons (e.g. SOM vs. PV cells) and their target sites on the postsynaptic cell (i.e. dendrite- vs. soma-targeting). For example, Sturgill and Isaacson (2015) recently showed that SOM-mediated inhibition in PCx is almost completely subtractive while PV-mediated inhibition is largely divisive inhibition. Our model has two types of inhibition, FFI and FBI, that are implemented the same way, as subtractive voltage changes in LIF neurons. However, these play very different roles in transforming OB input. We showed that the slope of the population input-output relationship (i.e. gain) is steeper when recurrent excitation/FBI is removed (leaving only FFI), indicating that recurrent excitation/FBI effectively controls gain while FFI is relatively ineffective at doing so (Figure 8). By contrast, gain barely changes when FFI is removed (leaving recurrent excitation/FBI), indicating that FFI’s contribution is predominantly subtractive. We have now also added an extensive series of simulations in which we vary the strengths of the different parameters controlling either FFI or FBI (Figures 5, 6). These all support our conclusion general that FFI is relatively ineffective and largely subtractive, and that output depends much more steeply on FBI. We have now added two sets of simulations. In one, we simply show that, when using our default parameters, entraining OB input with varying strengths of β oscillations (20 Hz) drives corresponding oscillatory output in PCx (Figure 5—figure supplement 2). However, in our parameter validation, we found that PCx output becomes strong oscillatory at ~20 Hz when feedback inhibition is very strong (Figure 5). We therefore also asked whether these oscillations persist when OB input is also oscillatory. We show that, with moderate feedback inhibition, PCx spiking follows oscillating OB input over a range of frequencies (20-80 Hz). However, with strong feedback inhibition, PCx output always oscillates around 20 Hz (Figure 5—figure supplement 3). We thought this result was interesting because, as reviewer 2 points out, odor responses in PCx often evoke β activity, although the origins of this activity remain poorly understood. These results therefore provide some insight into the origin of odor-evoked β oscillations in PCx. We also note that centrifugal OB-to-PCx projections could drive 20 Hz oscillations in OB. 5) While the authors show that the simple PCx circuitry is capable of reproducing many observed features they don't make explicit predictions. Figure 4 does contain implicit predictions about the role of the different network components but it would be very helpful and substantially strengthen the manuscript if these were made explicit in the Discussion. Direct experimental data to test the role of e.g. recurrent / feedback circuits or FFI would greatly strengthen the conclusions. Please pay particular attention to which modeling results may actually be attributable to piriform cortical function and which are simply epiphenomena of model parameters that are not genuinely constrained with respect to the biological circuit. The former require explanation, whereas the latter should be identified as such and not be reported as findings. We have added a section to the Discussion that explicitly states some of the predictions that we can make from our model. Some confusion was generated by a part of the Results section that contextualized some results. Following reviewer 1’s suggestion, we have moved this to the Discussion section. This section was also a source of confusion for reviewer 2 (please see below). We have therefore been more clear about which of these results follow necessarily from the way we constructed the model and which make testable predictions about the anatomical and functional organization of PCx. We are in the process of performing some of the experiments required to test the specific roles of recurrent and FBI circuits, and our preliminary results are very encouraging. However, these data are beyond the scope of this manuscript. When we labeled “no rec” we meant ‘no recurrent excitation and no feedback inhibition’; that is, we were not considering the case in which only recurrent excitation was removed. We apologize for this misunderstanding and we have corrected the labeling. Note, however, that we now also do examine the “no recurrent excitation only” condition when we vary recurrent excitation onto pyramidal cells only (Figure 6), as well as no FBI only when we vary recurrent excitation onto FBI neurons only and FBI itself. The reviewer is quite correct and this is an important point that we need to make clearly to support our conclusions. We have now provided an additional panel to this figure (now Figure 7F) that shows the distribution of spikes per neuron at multiple concentrations. Indeed, we show that the number of spikes a responsive neuron fires does not change substantively with concentration. This is a great suggestion. We have added concentration classification using population spike count, peak rate, and latency to peak, as well as combinations of both peak rate and latency to peak (Figure 9F). […] 1) While spelled out quite nicely in the last paragraph of the Introduction and in the first paragraph of the Discussion, the authors need to be even more explicit about (i) what the exact observations are that need explanation, (ii) what the assumptions are they are making and (iii) what they find and conclude. We thank the reviewer for making this point clearly. We have opted not to include bullet points in the Introduction and Discussion, but we have made these points much more clearly. We have also added new experimental data showing the OB-PCx transformation directly (Figure 1), and we explicitly state that the goal of this study is to understand how this transformation in implemented. We have now provided an extensive set of analyses that examine model performance (e.g. population firing rate) over a range of values for multiple parameters and sets of parameters. Briefly, we show that FFI provides a generalized suppression of model performance but doesn’t “shape” the PCx response. By contrast, the PCx output is very sensitive to a balance of recurrent excitation and FBI. In fact, because of these analyses, we made an interesting observation: We now show how changing the recruitment of FBI neurons or the FBI itself have very distinct impacts of population activity, and we thank the reviewer for these helpful suggestions. We have now added a section to the Discussion that makes explicit the testable predictions made by our model. Clearly, we do not share the reviewer’s perspective. Our goal here, which we now state much more clearly, is to understand the transformation odor information between OB and PCx that occurs within the first sniff after odor onset. Our relatively simple model circuit is able to implement this transformation, and by doing so, we make a number of testable predictions about the distinct roles that different elements the cortical circuit play. Our work does not validate, invalidate, or speak to role that oscillations play in coding olfactory or other information; it is a study of a neural circuit operation at a different timescale. Second, by approximating experimental measures of mitral cell spiking, we are implicitly incorporating some of the bulb’s inherent activity patterns in our model. Of course, we acknowledge that we are also missing some of it too, and we discuss this. However, we have now explicitly examined the effect of entraining bulb output at β frequencies, and we now show how this alters the early (i.e. first sniff) cortical response. Finally, in the parameter analyses that we have now added, we show that we can induce short, odor-evoked β-frequency oscillations in piriform by strengthening the feedback inhibitory synapse. Taken together, we feel that this work constitutes a valuable contribution, and that our revisions addresses the major issues the reviewer raises here. It is difficult to respond to this point without reference to the specific citations that the reviewer thinks we are misinterpreting. We also do not agree with the reviewer’s contention that nothing can be learned about neural circuit function by studying, or simulating, sensory responses under tightly controlled conditions. We feel that the integration and transformation of elemental odor information from olfactory bulb (i.e. a combinatorial glomerular code) into a synthetic representation of the odor that is robust to some features of the stimulus, such as concentration, is also an interesting feature of PCx. The processes we study in this model not only do that, but will also provide a platform for future studies, which can include other features of PCx that reviewer 2 thinks are more interesting. Spatially distributed ensemble codes have been shown experimentally, of course. In the present model, the transform is essentially predetermined.… different odors are defined by their different profiles of activation across glomeruli, and latencies of each. The divergence/convergence pattern onto PCx generate odor-specific patterns among PCx neurons: a generic spatial transform. This isn't a finding; it has been a foundational principle for decades. The selectivity for early MC responses is an idea, presumably motivated by rapid behavioral responses and fast functional adaptation in PCx pyramidal cells. I suppose hypothesizing that FBI feedback is primarily responsible for PCx pyramidal neuron response adaptation is potentially of interest, but this would need to be developed further. Here, again, we fear our failure to explicate the goals of this study has led to some confusion. Yes, the “spatial” aspect of our model’s transformation predetermined by the way we constructed the model, and we don’t claim that this is a finding. However, we do find (i) that neurons participating in these ensembles tend to be activated early even though OB input arrives throughout the sniff, and (ii) that different odors activate ~10% of PCx neurons across a range of input strengths. These findings are in accord with recent experimental observations (e.g. Stettler and Axel, 2009; Miura et al., 2012; Bolding and Franks 2017; Roland et al., 2017). The goal of the present study is to understand the circuit processes that underlie these observations. As above, in the revised manuscript we have now stated the goals of our study much more clearly, more clearly delineating between what are novel results of our simulations and what are the epiphenomena that follow necessarily from how we constructed the model. Here we think the reviewer is addressing the point about cross-odor correlations. In our model, a given odor activates about 10% of neurons distributed across the network, which does recapitulate experimental observations. However, we constructed our model assuming random connectivity between OB and PCx, which was justified by both course mapping experiments (e.g. Sosulski et al., 2011; Miyamichi et al., 2011; Ghosh et al., 2011; and others). We also assumed, as a starting point, random collateral connectivity. This produces random patterns of activity, which is consistent with experimental data that show no gross spatial topography (Stettler and Axel 2009; Miura et al., 2012; Roland et al., 2017). Consequently, cross-odor responses in the model have near-zero correlations; a “finding” that follows immediately from our starting assumptions. However, recent experimental studies have shown that cross-odor responses are relatively highly correlated (Otazu et al., 2015; Bolding and Franks 2017; Roland et al., 2017). This mismatch suggests that our starting assumptions of random connectivity – from OB to PCx, within PCx, or both – are likely incorrect. It would be great if we ‘solved’ this problem here, but that this is beyond the scope of this project. Instead, we describe our observation and lay out the problem and its implications. Following reviewer 1’s recommendation, we have moved this text to the Discussion. We have performed an extensive series of additional simulations in which we vary many of the model’s key parameters. The specific ways in which circuit output changes are insightful, and some of these are now included in the revised manuscript. However, in reference to this comment, these simulations clearly indicate that our finding that FBI is the dominant factor responsible for control gain in PCx is robust across a wide range and combination of parameter values. Also, it should be pointed out that there is no evidence that either FFI or FBI in PCx are tuned to specific odors. In fact, several studies have demonstrated quite conclusively that while odor responses in pyramidal cells are typically quite specific, both FFI and FBI are very broadly tuned (Poo and Isaacson, 2009; Hu et al., 2016; Bolding and Franks, 2017). We respectfully disagree with reviewer 2’s perspective. Bolding and Franks (2017) showed that neither the number of responsive neurons nor the number of evoked spikes (per cell or across the population) increases with odor concentration, but that response latency decreases and population synchrony increases with increasing odorant concentrations. Here, we show that a simplified model is able to recapitulate this general result. Of course the actual system will be more complicated. But, to us, this indicates that many of the parameters that reviewer 2 claims our model requires may not be necessary to account for these observations. We have now added an extensive series of parameter characterizations that address exactly this point. We thank the reviewer for this careful, detailed and critical analysis of our work. We have worked hard to address their points of concern and contention. We feel that we have addressed many of these, and that our manuscript is much improved because of this. Given our very different perspectives, we don’t expect a wholesale and enthusiastic endorsement of our approach, but we do hope the reviewer will agree that our manuscript is much improved and will be a valuable addition to the literature. […] However, I have several issues that need to be addressed to fully support some of the authors' statements and to remove one inconsistency. Unfortunately, a lot of confusion resulted from a simple mistake. As we said above, when we labeled “no rec” we meant ‘no recurrent excitation and no feedback inhibition’; that is, we were not considering the case in which only recurrent excitation was removed. We apologize for this misunderstanding and we have corrected the labeling. However, please note that in the revised manuscript we have included simulations in which we vary the strengths of individual parameters, including the strength of pyramidal recurrent excitation onto pyramidal cells only (Figure 6B). Absolutely! This panel was originally included, which is how we could make the case for enhanced synchrony, but it was then omitted in one of the subsequent revisions. Apologies, it’s back. As described above (Essential point #8), we have added these decoding analyses. We thank Alexander Fleischmann and Andreas Schaefer for comments on the manuscript. Animal experimentation: All experimental protocols were approved by Duke University Institutional Animal Care and Use Committee (protocol # A220-15-08), which was approved on 08-27-2015.